Downtown at the funky Manbites Dog Theater, tonight was the first of three consecutive Mondays of showing Japanese film, juxtaposing an old classic with a new film. I teach a course on the films of Yasujiro Ozu (and Indian filmmaker Satyajit Ray), and enjoyed visiting Japan last year; I specifically went almost in the shadow of Ozu to the Ozu Museum and sites around Kamakura where he shot many of his films, and I even found his bit-difficult-to-find grave (and the grave of Chishu Ryu, who often played a quiet and admirable father). I couldn't miss an opportunity to see Ozu on a big screen so, in spite of time challenges, caught the last hour and a quarter or so of the classic Tokyo Story. This film appears on many critics' all-time best films, and is certainly one of my favorites, a sentimental and characteristically Ozu understated film about the dissolution of family in post-war (WWII) Japan. What a masterpiece, and what a delight to see it again. I didn't stay for the second film, which sounded violent. I hope to make the next two Mondays in their entirety. I am quoting the email from their film coordinator, David Fellerath, below. For the next three Mondays in July, Movies @ Manbites will present Japan Then and Now, a series that pairs a classic Japanese film with a recent pop hit. The most jarring juxtaposition will happen this Monday, July 17, when we’ll show Ozu’s TOKYO STORY at 7:30 p.m., which will be followed at 9:45 by Miike’s ICHI THE KILLER. 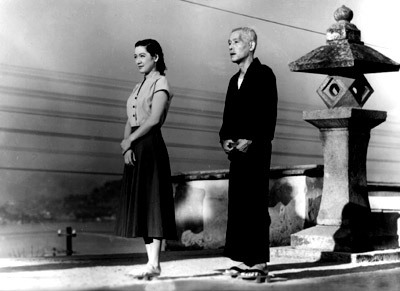 7:30: TOKYO STORY (Yasujiro Ozu, 1953) – A nearly unbearably moving tale of an elderly couple that travels to see their children. Perhaps the most lauded Japanese film ever. 9:45: ICHI THE KILLER (Takashi Miike, 2001) – Depending on your point of view, this is one of the most notorious or celebrated yakuza movies of the last decade, from Japan’s prolific gore-teur. 7:30: UGETSU (Kenji Mizoguchi, 1953) – An unforgettable epic of the divergent fortunes of two couples during wartime. 9:30: AZUMI (Ryuhei Kitamura, 2003) – A female assassin is charged with bringing peace to war-torn Japan. 7:30: KAGEMUSHA (Akira Kurosawa, 1980) – A poor thief is hired to pose as a dead warlord and becomes The Shadow Warrior! 10:45: BATTLE ROYALE (Kinji Fukasaku, 2000) – A brutal allegory: Most Dangerous Game meets Lord of the Flies. Not to be missed! $5 for the double feature. Movies @ Manbites is located at Manbites Dog Theater, 703 Foster St., Durham. In addition to our usual popcorn, soda, beer and wine, we’ll be serving edamame! 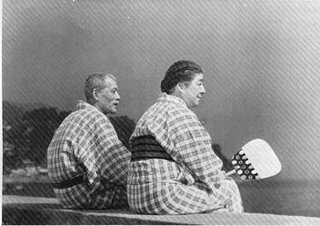 Pictures show Chishu Ryu and Chieko Higashiyama as Mr. and Mrs. Hirayama; and Setsuko Hara as Noriko with her father-in-law played by Chishu Ryu.